Whether you're a pro photographer or outfitted with a smart-phone camera, you'd be surprised how much material you can get with a day or a weekend exploring Milwaukee. The city's intense effort to create live-work-play concepts makes the downtown and its surrounding neighborhoods very vibrant. Also a hub for architecture — including Prairie and Classical styles — you needn't look far to find stunning, gorgeous buildings worth pulling the car over for. And don't forget that a four-season climate such as the one in Milwaukee means you rarely see the same scene twice. Try visiting a park in winter and summer, and see the difference. You can never photograph enough sailing vessels and the South Shore Marina (in Bay View, a 10-minute drive south of downtown via the Hoan Bridge) welcomes quite a few varieties, including yachts, sailboats and the Lake Express high-speed ferry. (Its port is just north of the marina.) You’ll also find people to blur out in your background shots, if so desired; a mix of joggers, bicyclists, dog-walkers and more. The Lake Michigan shoreline here isn’t so much about beach as it is about lakefront boulders and a rocky, unspoiled aesthetic. This is also a great spot to check out if fireworks are happening pretty much anywhere in downtown Milwaukee, as they are most weekends due to the festivals at Henry Maier Festival Park. Same goes for McKinley Marina on the city’s East Side, where you’re sure to spot white masts out on the horizon thanks to a community sailing school. Spanish architect Santiago Calatrava selected Milwaukee for his first North American project, unveiled at the Milwaukee Art Museum in 2001. (He’s since designed the World Trade Center transportation hub in New York City, open since last year.) 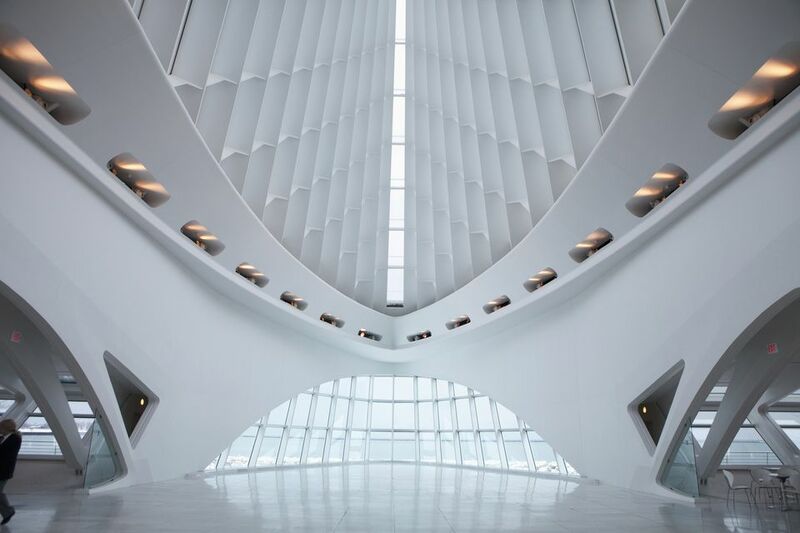 The soaring white wings on top of the Quadracci Pavilion are sometimes closed, sometimes open; either way, they’ve become an iconic image for Milwaukee’s skyline. What’s great about this site is that you can photograph it from many different angles, including from underneath the soaring wings (but outside), from the bridge over Lincoln Memorial Drive, inside the light-filled atrium, or from the waterfront. You’ll even note how seasonal weather affects your shots. Another stellar shot is from East Wisconsin Avenue, with Mark di Suvero’s striking red sculpture, “The Calling”, in the foreground. Visiting Villa Terrace Decorative Arts Museum — a former private estate that includes gorgeous gardens and amazing art on its grounds — is like taking a trip to Italy without leaving Milwaukee's East Side. And that's precisely what its original owner intended: the villa was modeled after an estate in Lombardy, Italy. Even if you don't have time to enter the museum, views of the exterior from along Lincoln Memorial Drive are worth it. This is a popular site for weddings, and galas are hosted here during the water months. But guests are always welcome, including at Sunday-afternoon concerts in the courtyard. Naturally, Italian music is performed. Wisconsin’s most famous architect — Frank Lloyd Wright, known for his Prairie Style residences and commercial projects — left quite a mark in Milwaukee. His legacy includes the six American System-Built Homes on Milwaukee’s South Side (where West Burnham Street meets South Layton Boulevard), which have been protected and preserved by Wright enthusiasts. They are also on the National Register of Historic Places — the homes were built during the 1910s as part of Wright's solution to affordable housing. Throughout the year there are several opportunities to tour the interiors of the homes; otherwise, the exteriors is equally photogenic. You literally can’t miss this shrine temple as you’re cruising along Wisconsin Avenue west of downtown Milwaukee. Just look for the dome and the glittering gold. While it’s a popular venue for weddings, social events and quinceañeras, simply touring the interior is a treat for all of the opulent detail, whether you’re looking up or down. Built in 1928, the building — which is of the Moorish Revival style — is listed on the National Register of Historic Places. A pair of camels kneel at the entrance, which can be puzzling at first glance because Wisconsin is not blessed with an arid climate.